Please read the quotes below which capture the essence of some of what I hoped to accomplish with the founding of Your Time For Creative Empowerment, Inc. I recognize we are only in the infancy stage of fulfilling the organization’s mission – a stage we could not have arrived at without a dream, tremendous determination and the selflessness of a number of people whose contributions and encouragement have played a big role in our buoyancy. 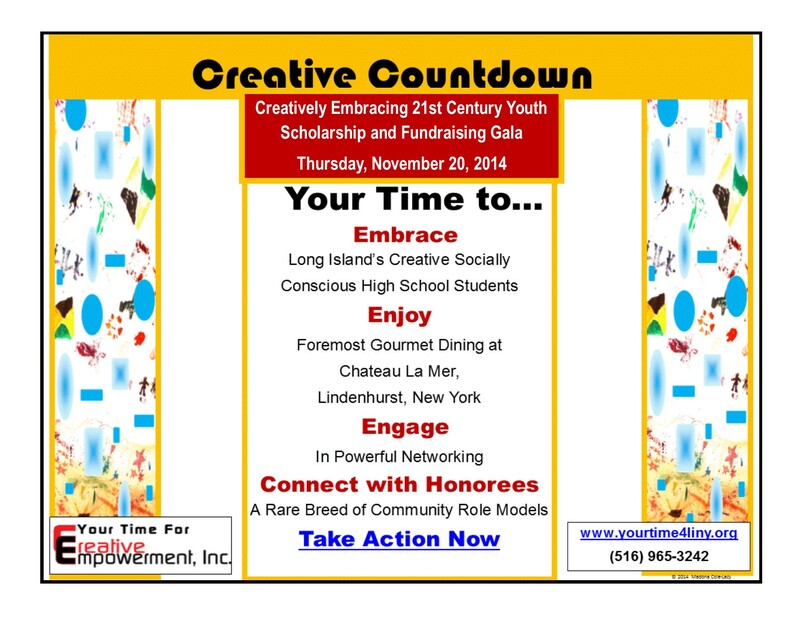 It is my intention to periodically shine the spotlight on those who are supportive of our quest to empower Long Island’s youth and families. That we have had no reason to worry about a home for our Self-Empowering Workshops, is owed to the benevolence of Molloy College’s Office of Advancement Associate Director of Development, Corporate Relations; Cynthia Costanzo-Metzger. The warmth with which I am greeted by Barbara Simms and Gina Renaldi of the Town of Hempstead each time I approach them with a space request for our organization’s Free Community Networking Soiree, gives me much encouragement!. The Art League of Long Island’s Jeanie Tengelsen Gallery’s perfect backdrop for our Scholarship and Fundraising Gala Kick-Off, would not have been possible without one for whom I have great respect – Charlee Miller, the League’s Executive Director, and the Development Director, Bobbie Janowitz. In the interest of transparency, I must admit that the inordinate energy and effort expended to get student participation, is disproportional to the outcomes thus far. This leaves me asking “WHY?”….. even as I graciously acknowledge the help of volunteers, teachers, parents and school administrators who like Dr. Deborah Wortham, Superintendent, and Mrs. Barbara Evans, Art Teacher of the Roosevelt School District, who saw the benefit in exposing their students to the Annual Creative Empowerment Arts Contest we are offering Long Island’s high school students. As part of our growth process, we welcome the support and assistance of like-minded individuals. We are open to constructive criticism accompanied by viable, executable suggestions. We take all concerns into consideration as we underscore our philosophy with an unwavering emphasis on the following: Your Time For Creative Empowerment is race, class, gender and socio-economically sensitive in all that we do. 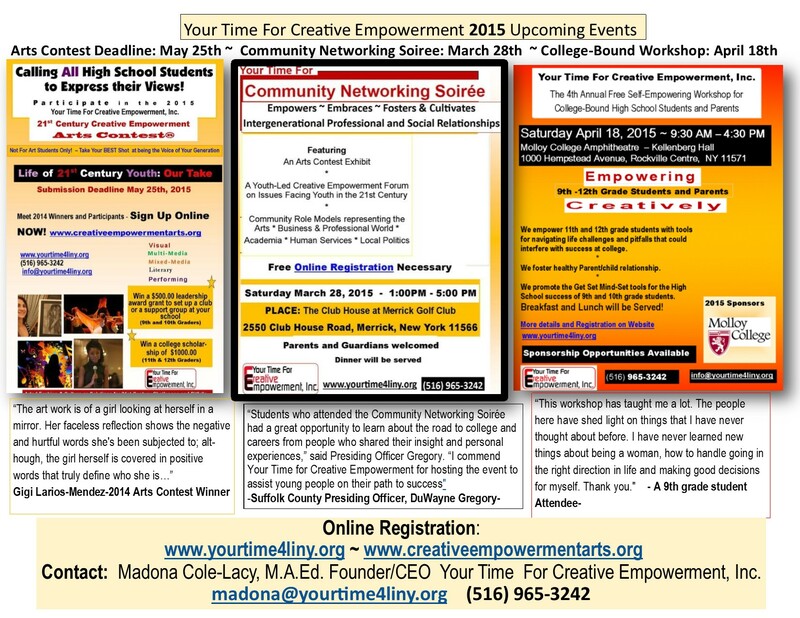 Madona Cole-Lacy, M.A.Ed, Founder/CEO Your Time For Creative Empowerment, Inc.